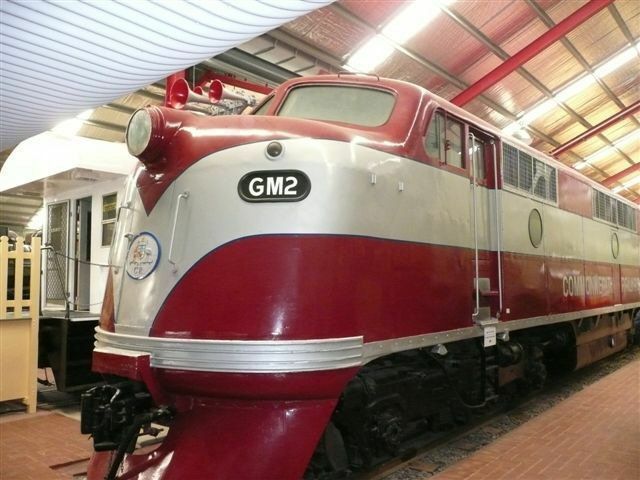 Adelaide's Train Museum has a red caboose that kids will love. 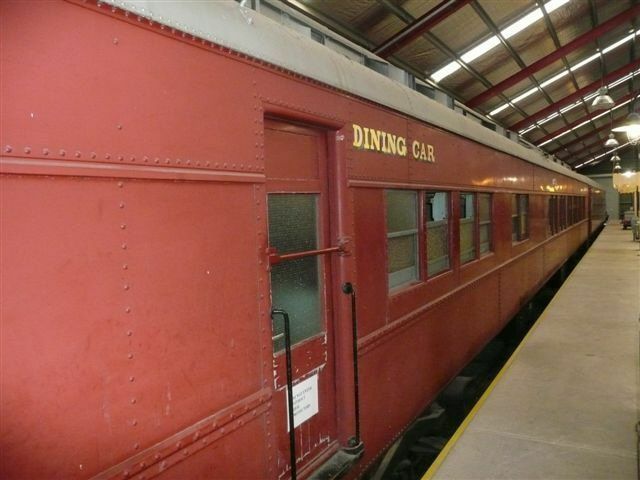 Classic passenger car at Adelaide Train Museum. 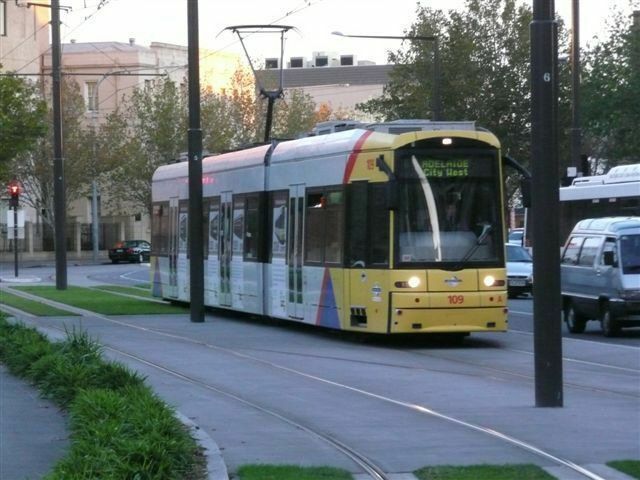 Free tram system makes getting around Adelaide easy. A sea lion pup poses for photos. We began our Australia journey in the city of Adelaide, located in the province of South Australia. An odd choice, some might think, but we came mostly because my husband, a railfan, just had to visit the National Railway Museum here. We discovered that Adelaide was, after all, the perfect place to begin our sojourn “Down Under” and our visit on Kangaroo Island just reaffirmed his wisdom. We perused the over 80 stalls of baked goods, candy, nuts, fish, meat, flower, vegetables and fruits (and tried a custard apple, which I commented that I had never before seen, so the proprietor handed me one to try). We settled on a light bite, but couldn’t resist a treat, so my husband had some authentic Greek yogurt with fresh fruit, and I had a scone and a cup of freshly brewed tea. The Market is on Gouger Street, which is also Adelaide’s main dining street. We noted restaurant after restaurant, mostly Asian, offering Chinese, Japanese, Thai, Vietnamese, and Malaysian cuisine. Additionally, there were a few French and Argentinean spots, as well as some seafood restaurants. We knew we would be returning here after some sightseeing later that day, and probably again, the next. We did, and enjoyed an amazing Malaysian feast the first night, and Greek-style seafood the following. Our hotel was located on North Terrace, also home to the stately Parliament House and Government House, plus several museums (all free to the public) and other places of interest. The Adelaide Festival Center, just behind the Parliament House is this city’s answer to Sydney’s Opera House, considered by some to have better acoustics. It contains four theaters, and an art gallery, plus outdoor seating in an amphitheatre, part of the outdoor plaza where people can come just to relax. The State Library, with both classical and modern architectural features, offers many research opportunities for those interested in Australian and Aboriginal history, or those involved in genealogy. Next door is the South Australian Museum, a natural science museum with displays on biology and mineralogy among other sciences, but its claim to fame is that it presents the world’s largest collection of artifacts of the Aboriginal peoples of Australia. This is certainly a great way to introduce your family to the native Australians. Next along the avenue is the Art Gallery of South Australia which has a nice collection of American, European and Asian art and artifacts, but whose real treasures are the many Australian works of art that I was not at all familiar with – and happy to meet. Partly concealed behind the library is Adelaide’s fascinating Migration Museum, whose contents surprised me most of all. Unaware that like the United States, Australia is a nation of immigrants, this museum helped me trace the lives of settlers from all corners of the world who now call South Australia their home. Exhibits cover why people decided to emigrate there, how they traveled, and what they brought with them, in terms of material possessions as well as their contributions to the society. Included are examples of travel documents, photographs and many personal possessions of the settlers, drawing portraits of these small waves of immigrants that began settling in South Australia in the 1830s and intensified after World War II. Also explored is the relationship between each immigrant group and its earlier counterparts, and with the Kaurna, the Aboriginal people of this region of Australia. One of my favorite exhibits was the “Banner Collection” which dates back to the museum’s opening in 1986 and is ongoing. To date, over 40 small-sized works, created by communities of ethnic groups, symbolize their memories of homelands and hopes for their new lives in Australia. Reproductions of these banners are available as postcards in the Museum Shop. The Migration Museum also hosts special temporary exhibitions. The museum is housed in building with an interesting history as well. Constructed by the British in 1845 as a boarding school for the local Kaurna children, it then housed a Destitute Asylum between 1852 and 1918. The museum’s courtyard hosts the touching “Settlement Square.” Family members may purchase a commemorative pavement brick engraved with an immigrant’s name, birthplace and date of arrival to be added to those in place to create a visual representation of the extensive reach of immigrants to South Australia. Another element of reflection is the “Reconciliation Plaque” presented in 1999 by the British to the Kaurna people. It is an apology for having dispossessed them of their homes and separated their families by placing children in schools such as the one on this property. One attraction I wish I had not missed during our brief visit to Adelaide is the Tandanya National Aboriginal Cultural Institute. Tandanya, meaning “place of the red kangaroo” in the Kaurna language, presents traditional and contemporary indigenous Australian visual art and performances. Visitors come here to listen to didgeridoo players, see dance performances and listen to tales about the heritage of the Kaurna and Torres Strait Islander cultures. Halfway around the round is a long way to travel for anything. But, when there is something there that reminds you of home, it makes it worthwhile. Such is the case with the fabulous National Railway Museum in Port Adelaide, just a short train ride (!) from downtown Adelaide. There are many railroad museums all over the world, with many one-of-a-kind pieces left from hundreds of locomotives or thousands of passenger or freight cars. The equipment on display here, inside and outside, looks as though most of it had been built yesterday, belying their actual ages, and making it a “fountain of youth” for trains. Many pieces come from the South Australia Railway, and run the gamut from the signature 76-ton Pullman dining car Adelaide, to a very American-looking caboose; other exhibits include many diesels, steam locomotive from small to large, and a miniature railroad that you can ride around the premises to look at the equipment that is on display outdoors. 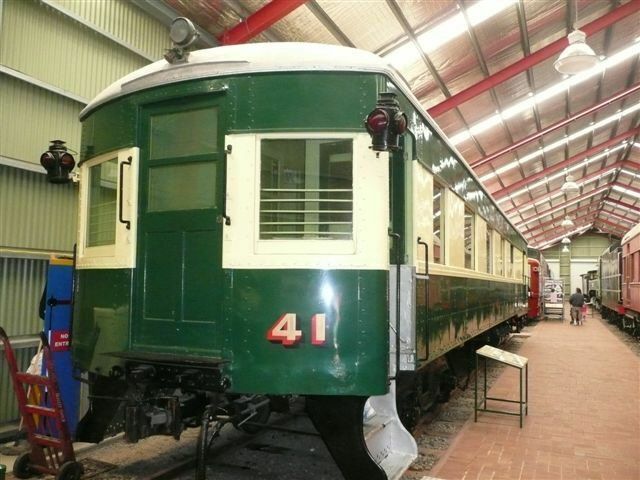 Other region’s trains are represented as well, including a whole building dedicated to Commonwealth Railways (the first attempt to link the East and West Coasts of Australia), and to build a line north to Darwin, which became a reality only recently. Australia adopted many railroad operating practices from the USA, and much of what is in evidence looks like it belongs somewhere in North America, albeit with different names on the sides. Self-propelled diesel railcars are also in evidence, including one built to American plans from the J.G. Brill Company in Philadelphia in 1928. Also on view is its cousin CB-1, a rail diesel car built by the Budd Company and shipped to Australia in 1951, a sister unit to ones that ran all over the United States, Canada and a few foreign countries, preserved to look as though it would be running tomorrow. There are over 120 trains to look at here, at Australia’s largest railway museum, and any young engineers would be enthralled to visit such a resource. Even Thomas the Tank Engine shows up periodically. There is a gift shop (naturally) as well as a seasonal cafeteria car to provide snacks. All around, this is an excellent choice for anyone who wants to learn about Australian railroad history and the treasures here make for a unusual add-on to your South Australia family vacation. One late afternoon, after touring around and visiting some museums, we hopped onto a tram at Victoria Square and headed west for a 30-minute ride to the end of the line at Glenelg. This beach resort area was quiet at this time the year, but we could imagine it full of families during the warmer months. There is an old-fashioned seaside atmosphere where amusement arcades, shops, cafes and restaurants (serving local fish and chips, and more) line Jetty Road, which ends a short walk to the shore. We arrived just at sunset and it was a stunning site. Not far from downtown Adelaide there are other sites to see. Animal lovers will enjoy the Adelaide Zoo and the Cleland Wildlife Park where you can get “up close and personal” with kangaroos and koalas. Further from town is the Barossa Valley, one of South Australia’s must-visit stops for farm-to-table foodies. Among the best wine producing regions, it’s responsible for about 70% of the country’s exports. It’s interesting to note that grapes growing in this area began with vine cuttings brought by German Lutherans when they emigrated to South Australia in 1838. The one daytrip we did make was to Kangaroo Island, about 10 miles off the coast. Short on time, we went by ferry early in the morning and returned by air in the early evening, which saved a good deal of travel time. This was a fabulous day, but a very long one, and if we had it to do over again, we would have spent the night on the island. The third largest island off the coast the Australia, “KI” is approximately 96-miles long and 34-miles wide and was uninhabited by humans when discovered by European explorers in 1802. However, several Aboriginal campsites were discovered in the 1930s, indicating that native people were living on it as long as 16,000 years ago. Native vegetation still grows on almost half of the island, and one third of the land is now National and Conservation Parks. We came here to see wildlife and unspoiled land and we weren’t disappointed. We began our day with a coach (bus) ride from our hotel to Cape Jervis, where we boarded a comfortable SeaLink ferry for the 45-minute crossing to Penneshaw. Sealink operates the primary sea transportation ferry services to KI and offers a range of departure times and other services. Once on dry land, we boarded their coach which was waiting to tour us around on the day’s adventure. Our group was small and our guide was lively and informative. We learned that KI is so named after the enormous colonies of kangaroos found there by the Europeans; kangaroo meat kept the explorers alive on the island, and, as they sailed back to Europe. We were all anxious for kangaroo sightings, but we were told that they are most visible late in the afternoon, so we would have to be patient. 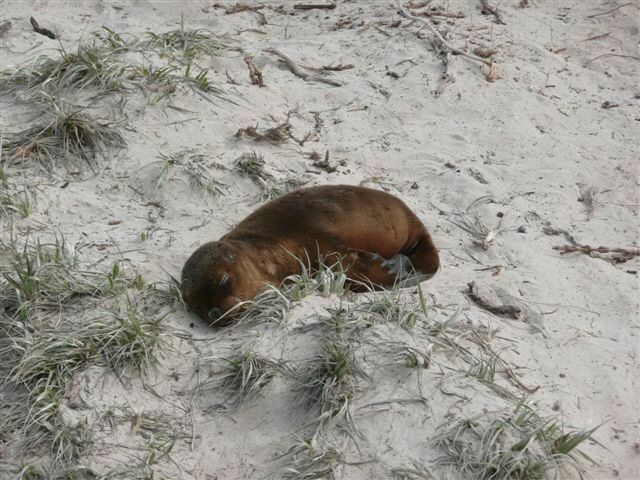 Our first stop was at Seal Bay where we walked down to the beach and observed the second largest breeding colony of sea lions in Australia, frolicking on the dunes and into the surf. 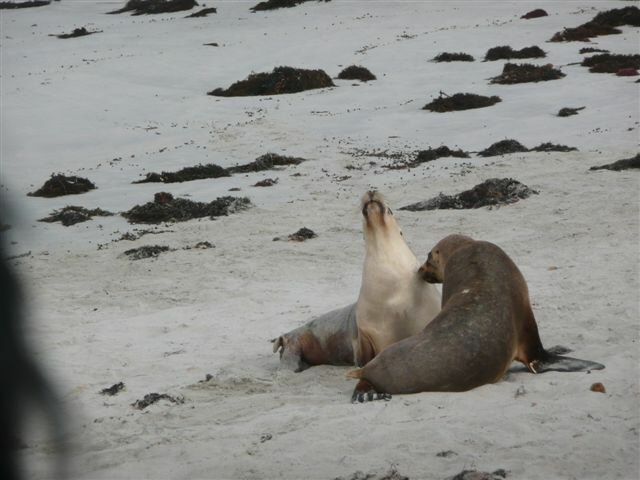 We saw several pups (adorable) awaiting their mother’s return with food from the sea, and learned that if the moms don’t return, the pups will perish, as they will not be adopted by other females. Our next stop was at the interactive Birds of Prey presentation where we learned about eagles, hawks, falcons, owls and kookaburra and had the chance to hold some on our gloved hands or have them alight on our laps. After a lunch stop, we headed to the southwestern part of the island on a very scenic drive to the Flinders Chase National Park area, a sanctuary for many native animals including kangaroos, wallabies, koalas, echidnas, goannas and more. We drove to see the Remarkable Rocks, a geological formation started 500 million years ago, and an icon of the Island. Balanced on a point at the edge of a cliff overlooking the ocean, the enormous, bizarrely-shaped formations of granite, sculpted by nature, seem to change with the reflections of the sun. Climbing is permitted and photo ops are abundant, but climbers are warned to be very careful as it can be quite windy, and the ground can be slippery when wet. Next, we drove past the iconic 1906 Cape du Couedic Lighthouse overlooking the sea, and it was on to Admiral’s Arch. Here we walked along a boardwalk down a rugged cliff face to a spectacular natural rock arch carved by the action of the ocean. Underneath the arch was a playground for a colony of New Zealand fur seals who dove and swam in the surf and snoozed on the sun-drenched rocks. On our way to the airport in Kingscote for our return to Adelaide, we stopped at a wildlife preserve and were thrilled to be greeted by kangaroos hopping across the road right in front of us, parents and babies gathered together, and wallabies snacking on the grass. Harder to see were several sleeping koalas curled up high above us in the trees. Everyone had their cameras out and were snapping away furiously. This was a great end to a wonderful day, but we realized that there was much more to do and see on Kangaroo Island. A return visit might include swimming at the many beautiful beaches, touring a eucalyptus distillery, sheep dairy and honey farm, visiting art galleries and wineries and taking a penguin tour. More adventurous visitors would enjoy the many hiking trails, ATV tours, scuba-diving and surfing. A multi-day visit is advised and many restaurants and lodgings, ranging from campgrounds to inns and lodges to luxury eco-resorts can be reviewed by visiting Kangaroo Island’s website. The helpful South Australia tourism office has a website that makes a good starting point for planning your visit. Adelaide is a small city, but one with lots of charm as well as history and culture. At its center is a park called Victoria Square, and the city is laid out in a grid, one imperial mile in each direction from this center point, making it simple to navigate. The tram system is easy to figure out, and is free of charge in the downtown business district. We stayed at The Playford Hotel, and this well-situated boutique hotel was an excellent choice. Its art-nouveau style blended well with the modern facilities — including a nice indoor pool and award-winning restaurant — and the staff was immensely helpful. The room was spacious and comfortable, and the services (including free soap and dryers in the laundry room) were plentiful. It quickly felt like home. Sadly, after three days in Adelaide we left early via an early morning train to Melbourne, our next, and more famous destination. While excited to experience this more prominent city, we were glad to have spent time in Adelaide as its residents are gracious and welcoming and it offers interesting history and culture, great food, a fun beach and an all-over nice vibe. This is a place I’d be happy to return to if I’m ever lucky enough to be in Australia again.